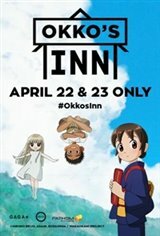 Fathom Events and GKIDS have partnered up again to bring Okko's Inn to theatres for two-days only! After losing her parents in a car accident, Okko goes to live with her grandmother, who runs a traditional Japanese inn. Okko soon discovers there are spirits only she can see - welcoming ghosts who keep her company and help her navigate her new environment. The latest feature from famed director Kitaro Kosaka blends idyllic landscapes with storybook charm. Okko's Inn delivers a rare ghost story that is firmly grounded in the trials and joys of humanity.